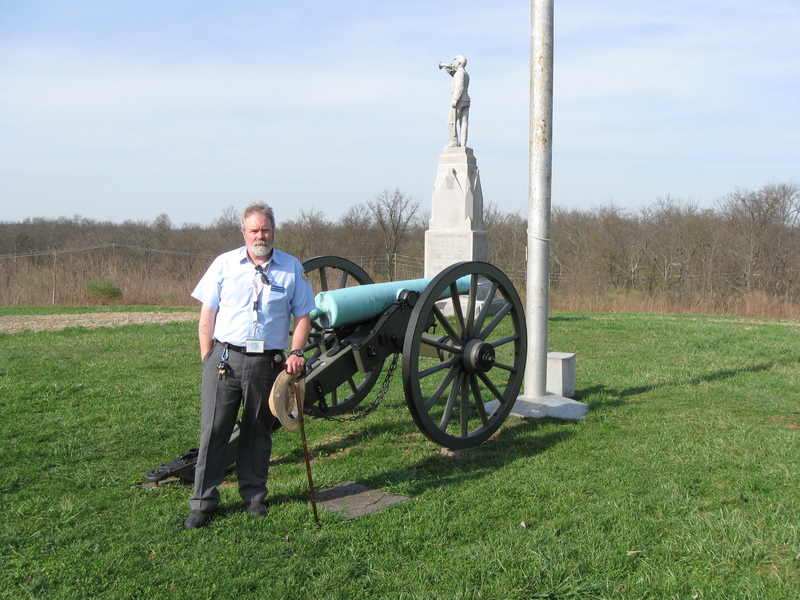 Gettysburg Licensed Battlefield Guide Stuart Dempsey is striking a Napoleonic pose on Barlow Knoll. He is standing among the guns representing Lieutenant Bayard Wilkeson’s Battery G, 4th United States Artillery on July 1, 1863. The North Gettysburg Shopping Center is in the left background. This view was taken facing south at approximately 4:30 PM on Friday, April 2, 2010. In our sixteenth Eleventh Corps post, Stuart speculated on why Brigadier General Barlow left his assigned position near the Alms House and moved to Blocher’s Knoll/Barlow’s Knoll. In the seventeenth post, Gettysburg Licensed Battlefield Guide Stuart Dempsey showed us the topography of Barlow’s Knoll and how the placement of monuments on the knoll doesn’t exactly match the locations where troops were positioned. In today’s Eleventh Corps post, Gettysburg Licensed Battlefield Guide Stuart Dempsey brings all of Adelbert Ames’ Brigade to the Barlow’s Knoll area, where they would be attacked by Georgians on July 1, 1863. This map shows the location of where our Eleventh Corps at Gettysburg videos were produced. Videos #1-#53 were shown on other maps on our previous posts. Video #54 was taken on Barlow Knoll by the monument to Brigadier General Francis C. Barlow. Videos #55-58 was taken on the summit of the knoll near Wilkeson’s Battery, and the monument to the 153rd Pennsylvania Infantry Regiment. This map was created facing north at approximately 11:00 AM on Sunday, April 11, 2010. 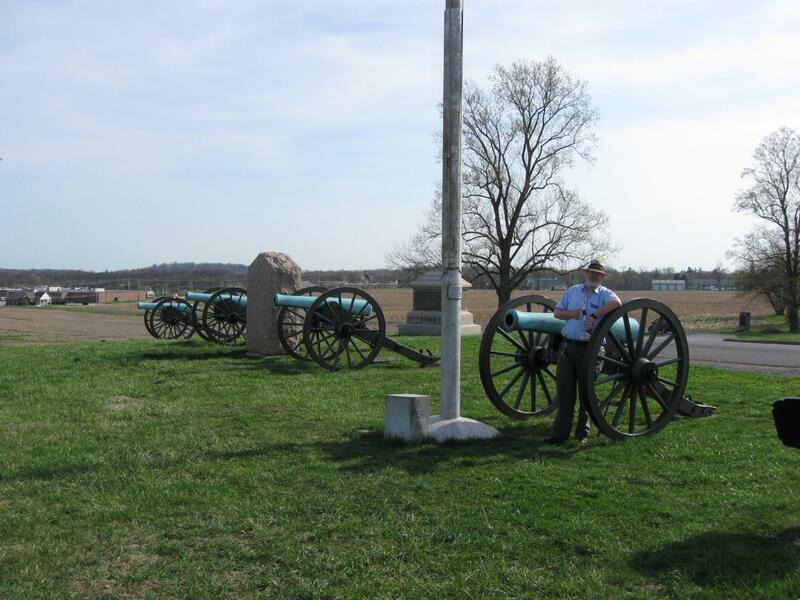 In Video #57 (Videos #1-#56 were shown in our previous Eleventh Corps posts) Gettysburg Licensed Battlefield Guide Stuart Dempsey is standing on Barlow Knoll near the cannon representing Battery G, 4th U.S. Artillery, commanded by Lieutenant Bayard Wilkeson. Stuart explains how Barlow deployed his units on the knoll in stages. This view was taken facing south at approximately 4:30 PM on Friday, April 2, 2010. Licensed Battlefield Guide Stuart Dempsey is standing on Barlow Knoll/Blocher’s Knoll. He is by the left gun marking the position of Bayard Wilkeson’s Battery G, 4th U.S. The monument to the 153rd Pennsylvania Infantry Regiment is int he background. This view was taken facing northeast at approximately 4:30 PM on Friday, April 2, 2010. In Video #58 Licensed Battlefield Guide Stuart Dempsey is standing on the “summit” of Barlow Knoll/Barlow’s Knoll. He shows us how Adelbert Ames’ Brigade was deployed on the knoll when they arrived on July 1, 1863. This view was taken facing north to northwest to west to northwest at approximately 4:30 PM on Friday, April 2, 2010.